Life is still like a hurricane, here in GamesRevisited. We still don’t have the race cars, lasers, or aeroplanes, but Dave has been back to Gregg’s and bought another Sausage Roll. So fun times all round. 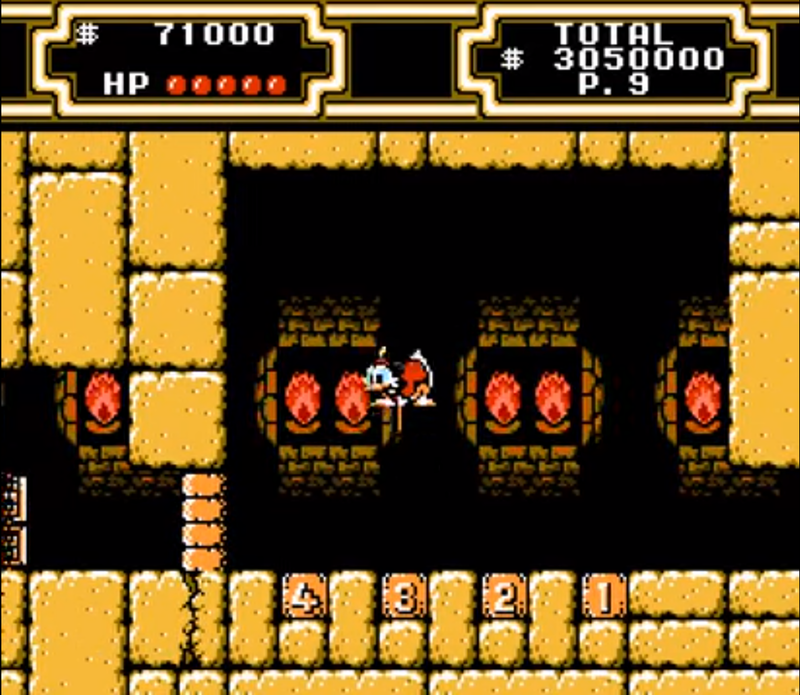 DuckTales 2 is short, with only 6 levels. I was able to fumble around, fail once, then complete it twice gaining both endings inside 2 hours. Though, I did cheat on the map hunting playthrough. This being a Capcom platformer, you probably know what to expect. If not, you get a tight platformer, with nice, simple controls, and a choice of what order you do the missions. Everything is clear, and you’re rewarded for exploration. Once the 5 levels are done, you unlock the final mission, where you take on the final boss. 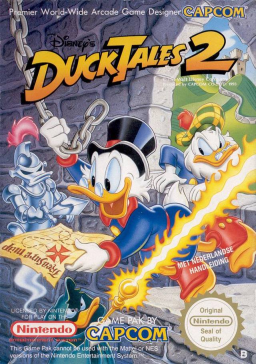 The key difference between (DuckTales) 1 and 2, is that DuckTales 2 allows you to collect 6 hidden pieces of a treasure map (there are 7 pieces, but you start with 1). Collect all of them, and you get a secret level where you try to find the secret treasure. Do all of that and you will unlock the alternate ending. 5 of the 6 pieces are well hidden, and will take significant exploration, so you will need explore every nook, try and jump over/through every wall to find the pieces. But once you know what you’re doing, a normal run is about 20 minutes, and a map run is closer to 30. 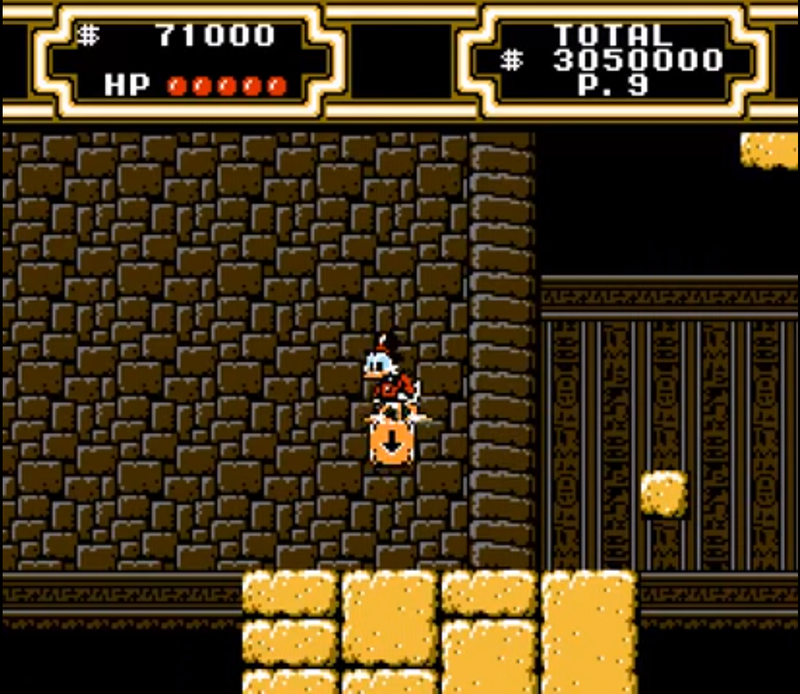 Each level has a theme, and each level has its own unique style: Niagara is blue and watery. Eqypt is set in a pyramid, so it yello and stoney. Scotland is set in a castle, Bermuda is on a cool ghostship and Mu is in a sunken city. If you’ve played DuckTales you’ll recognise the style of levels as, while different, they hark back to equivalent levels in DT1 employing the same styles and tropes found therein. The enemies don’t have much variety, and unlike DT1 they are not unique to a level. So you’ll get a few of the same things popping up on other levels. The other, slightly buigger issue with the enemies is that you don’t get many on screen at a time. Any more than one, and you get significant slowdown, as a result, enemies will come one at a time in single file for most of the game. Other than that? The music is a bit bland, there are no standouts tracks and on my 3rd playthrough I muted the TV in favour of the DT1 soundtrack. The music isn’t terrible and it all fits the levels theme well enough, it is just a bit meh. You can listen here. 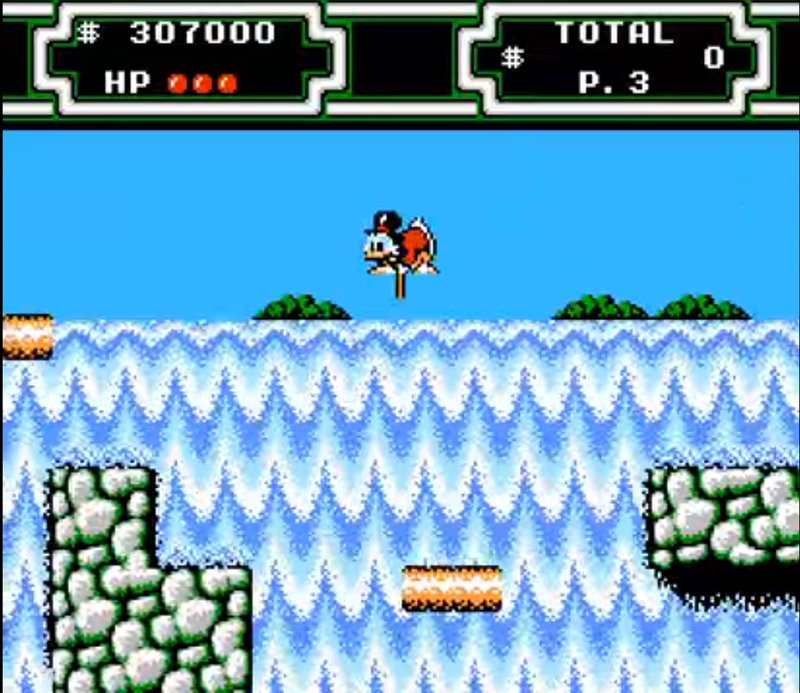 DuckTales 2 is a platformer, so you run from left to right, occasionally up and down, and sometimes right to left, while jumping over gaps. It doesn’t stray too far from the NES platformer formula. You get all the same “ability” from the first game with the slightly improved pogostick, but this time you get a few new abilities such as pulling switches, and moving boxes to traverse ledges, it isn’t much, but it does mean DuckTales 2 feels a little fresher. 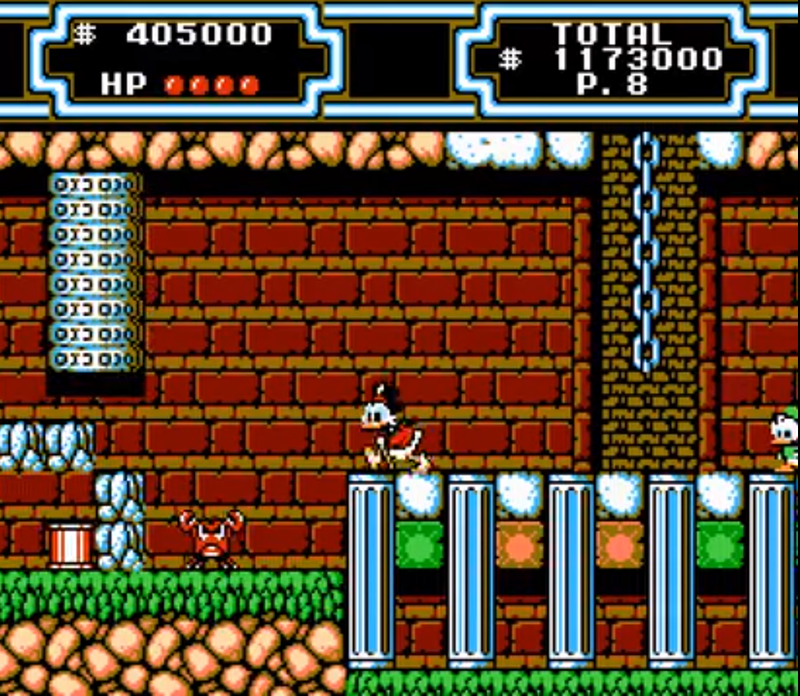 Since some of the puzzles are difficult enough to make you stop and think for a moment there is a little bit more going on than the first DuckTales, or even “better” games such as Super Mario Bros 3. I swear to god it is a puzzle! I guess DuckTales 2 is a perfect sequel in some ways, it is pretty much more of the same and it expands on the formula just enough for it to feel fresh. It isn’t a cut and paste rehash like Crazy Taxi 2, but it doesn’t change enough like a Silent Hill 2 to be able to stand up on its own. Is DuckTales 2 a great game then? Well, it is a little better than DuckTales 1 and that was a fairly solid game. The new additions to the gameplay make it a slightly more enjoyable, and while the difficulty is low, it is less child-like easy. The map hunt adds some depth, and despite the negatives around the limited enemies, DuckTales 2 is overall a more rounded and enjoyable game, and as a result is a better game. Cons: bit short, music is meh. Ouch! Too rich for my blood! I keep forgetting there’s a sequel to Ducktales. Maybe one day they’ll remaster this one too. Otherwise, I need to find a copy of it sometime! I still collating which one is better the 1st one or the 2nd.